I just love making these spa sock cupcakes and who doesn’t like warm fuzzy socks? I wrapped this sock cupcake for my daughter’s teacher for Valentine’s Day, but you can make these for any holiday or occasion. These cute treats make great, inexpensive gifts for your kids’ teachers, for friends, bridal or baby showers, or even inexpensive party favors for your tween or teen’s birthday party. They are quick and easy to put together and I just love how they look wrapped in cellophane and tied with a pretty ribbon. If you are using these as favors, these would also look adorable if they were set up on a tiered cake plate or on a cupcake tree. You can find spa socks for this project at most stores in just about every color. I purchased a bundle of three pairs for just $4.99 at Marshall’s and they seem to be nice quality socks. I have also seen them at TJMaxx, Ross, Kohl’s and even at Target. You also can get a pack of spa socks from Amazon shipped right to your door! All of the other supplies can be purchased at either the craft store or possibly at your local dollar store. 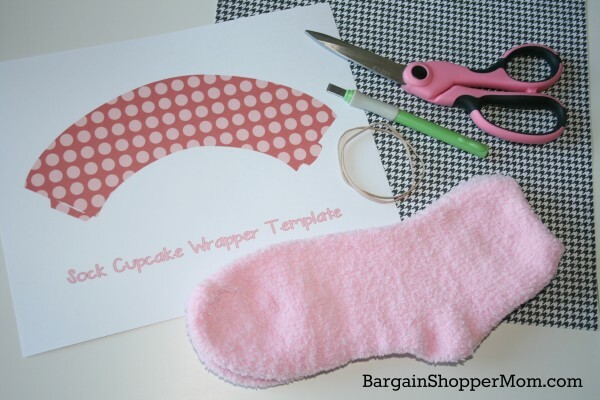 I included a FREE template so you can easily create your own cupcake wrapper to match the socks that you choose. To save this tutorial for later, just save it to your Pinterest boards here. Using your home printer, print the Everyday Savvy Spa Sock Cupcake Template onto heavy, white cardstock and cut it out with your scissors. Place your template onto your coordinating scrapbooking cardstock and use your pencil to outline the cupcake wrapper. Cut out your wrapper. Making sure you have either a cutting mat or a piece of cardboard underneath your cupcake wrapper, carefully cut the slit at the end of the cupcake wrapper with either an x-acto knife or a razor blade. Insert the tab from one end of your wrapper, into the slit at the other end of your wrapper and place a piece of scotch tape on the inside of your cupcake wrapper to secure it. To make your “cupcake”, stack one sock on top of the other. Start rolling your pair of socks at the toe area so that as you roll, each layer is ¼ inch lower than the previous layer. Keep rolling until you have reached the other end of socks and it looks like cupcake frosting. Take a rubber band and secure the socks at the bottom of your cupcake. You may need to adjust the rubber band a bit so your “cake” fits properly in your wrapper as all socks are different. Place your socks in the wrapper and use your fingers to adjust and fluff the “frosting” until it looks good in your wrapper. Take your pompom and place a straight sewing pin through the center and place it on the very top of your “frosting” so it looks like a cherry. The pin will help secure it in place. Wrap your “cupcake” in cellophane and tie it with a pretty ribbon. Be sure to print the Everyday Savvy Sock Cupcake Wrapper Template onto heavy white cardstock to make it easy to cut use for tracing. Walmart sells a 100-sheet package of white cardstock by Georgia Pacific in the Office supplies section for around $6. It’s great to have on hand for projects. Select a sheet of coordinating scrapbooking cardstock to match the socks you select. 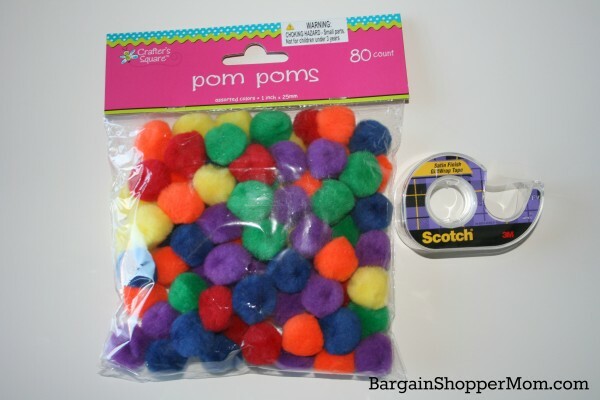 I bought these 1-inch pom poms at The Dollar Tree, but I also noticed Joann’s and Michael’s carries these as well. Joann’s has them in pretty pastel colors. They are also available in many colors or all red from Amazon. 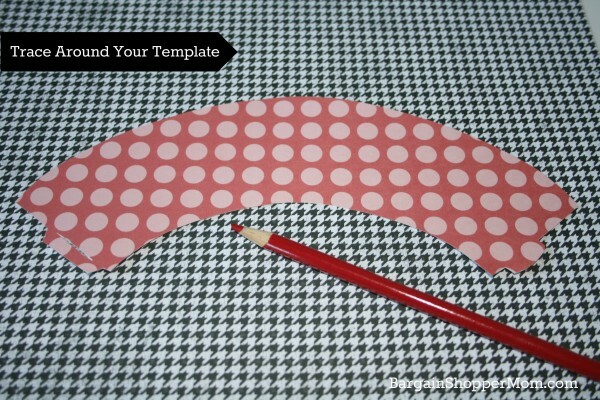 Cut out your pattern and use a pencil to trace around the pattern onto your scrapbooking cardstock. If you chose a cardstock with a medium or large design on it, be sure you move your pattern around so the design will appear in the right place on your cupcake liner. Once your wrapper is traced, cut it out with your scissors. Place your wrapper onto a self-healing cutting mat or on a thick piece of cardboard and use your x-acto knife to cut out the slit so that the tab on the other end of your wrapper will fit into the slit. Fit the tab into the slit and place a piece of scotch tape on the inside of the wrapper to secure your tab. Lay your socks one on top of the other and start at the toe area and roll your socks. As you are rolling them, graduate the rolls by 1/4 inch with each layer until it forms “cupcake frosting”. Secure the bottom of your “cupcake” with a rubber band about 1 – 1 1/2 inches from the bottom. You may need to adjust the rubber band so that your “cupcake” fits properly into your wrapper. Then use your fingers to fan out the frosting layers so that it fits perfectly into your wrapper. Put a straight sewing pin with a head on it through the top/center of your pom pom and stick it into the top of your “cupcake frosting” as the cherry. The pin will help keep your pom pom in place. Wrap your “cupcake” in cellophane or in a medium to large cello bag and tie with a pretty ribbon. 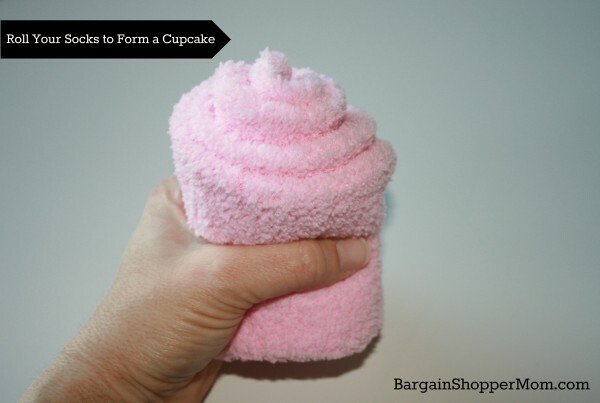 Be sure to pin this cute sock cupcake tutorial for later. Simple Iced Tea Cup Teacher Appreciation Gift with Printable Tag – I have made this for teachers and they really like it. I usually drop a gift card inside too. This is a really cute idea and I love the free printable wrapper! Thanks for sharing it on Thrifty Thursday! This is such a cute idea and the free printable is great!! Thanks for sharing! (I just wish the template was larger, but I can handle that). The template doesn’t seem to be working. Can you email it to me please???? I am going to make these for my kids school holiday store. Thanks so much! The file is all fixed! We had a blog crash a few weeks ago and it might have removed the file then. Thank you — it worked! What a great idea! Thanks for sharing, Melissa! So very clever and creative.